Fritz Reiner, Chicago Symphony; Arthur Fiedler, Boston Pops Orchestra. HDTT HDCD406. Richard M. Daley, Mayor of Chicago, said of Sir Georg Solti, "Under his direction, the Chicago Symphony has achieved new heights, and is respected internationally as a world-class organization." Any number of other people, including Solti himself, expressed that misleading sentiment, proving that people have short memories. 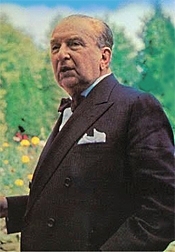 Apparently, they had all forgotten that half a dozen years before Solti, the great Fritz Reiner conducted the Chicago Symphony (from 1953 to 1963), raising it to international prominence, and through his RCA Living Stereo recordings helping to pioneer the stereo age. I mention this information because I always welcome any new remasterings of Reiner's work, especially when they are as good as this one from HDTT (High Definition Tape Masters). 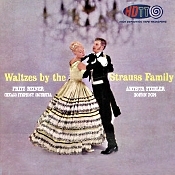 It was with Richard Strauss that Austro-Hungarian born Fritz Reiner (1888-1963) made his name with some of the earliest (1954) stereo recordings of R. Strauss's work; however, Reiner was no slouch when it came to Johann Strauss and family, either, as demonstrated by this brief collection of waltzes by Johann II and Josef Strauss. As I said about Reiner's Johann Strauss music in an earlier review of JVC's remastering of the same material, I like the music, and I like the way Reiner plays it. Almost everything Reiner conducted came out fresher, more pointed, more secure, more clarified, and more refined than ever before. Sure, Willi Boskovsky, another of my favorites in the Strauss family, put a touch more bounce, more verve, into in Strauss waltzes, but Reiner added the element of purity. I like the selections here, too: three Strauss Jr. waltzes: "Morning Papers," "Emperor Waltz," and "On the Beautiful Blue Danube"; and Strauss Jr.'s brother Josef Strauss's waltz "Village Swallows." For good measure, HDTT have coupled Reiner's J. Strauss recordings with Arthur Fiedler's Boston Pops accounts of Edward Strauss's "Doctrines," Josef Strauss's "Music of the Sphere," and Johann Strauss Jr.'s "Roses from the South." Fiedler, the longtime conductor of the Boston Pops, probably sold more albums in his lifetime than any single conductor in history, and we generally associate him with light music. Perhaps that's why he handles Edward, Josef, and Johann Strauss's music so handily. It may not have quite the same elegant charm of Reiner's Strauss, but it has plenty of pizzazz to compensate. RCA recorded the music in 1957, and HDTT transferred it from several RCA 2-track tapes. I alluded above that I had reviewed some time ago another remastered edition of the Reiner Strauss music, that one by JVC in their XRCD audiophile series. Naturally, I wondered how the HDTT product would compare to something costing quite a lot more, so I put them in two separate CD players and listened back and forth. Not fair, I hear someone say. JVC not only used a costlier process but took their music directly from the original RCA master tapes, whereas HDTT had only the commercial RCA tapes to work with. Never mind, comparisons are comparisons. Now, here's the thing: As expected, the JVC product did sound a tad better than the HDTT. The JVC seemed a trifle clearer and cleaner to me, with a bit tauter, deeper bass. Keep in mind, however, that you pay anywhere from two to four times as much for the JVC disc, depending on the HDTT format you choose; and if you didn't have the two discs playing side by side, I doubt that even the most golden ears would know there was a difference at all. Which means that the HDTT remastering sounds darned good. Like its more-costly JVC counterpart, the HDTT disc sounds smoother and better detailed than the standard RCA product and captures the natural warmth of the venue better, too, at least in the case of the Reiner. I did not have a comparison to make for the Fiedler recordings. However, I can assure you the Fiedler performances sound excellent as well. If anything, they appear even wider in stereo spread and a little more forward in frequency balance than the Reiner things. Of the two orchestras and concert halls represented here in Chicago and Boston, I preferred the Chicago recordings for their slightly warmer, more realistic sound to the Boston recordings with their more hi-fi-oriented sonics. Nevertheless, preferring the one very slightly over the other takes nothing away from the Boston recordings or performances. Everything on the album is first-rate. Volker Reinhold, violin; Ralph Zedler, piano. MDG 903 1909-6. You'll remember that about a year earlier, violinist Volker Reinhold and pianist Ralph Zedler made a recording of six opera fantasies by the Spanish composer and virtuoso violinist Pablo de Sarasate (1844-1908). With the present album they have given us seven more of Sarasate's fantasies, completing the number the composer wrote. Although the selections on volume two are not quite as famous as those on volume one, it is perhaps understandable, and the works are certainly as commendable. First, however, a word about the artists, of whom you may not know much more than I told you last time. 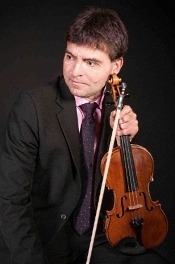 Since 1989 violinist Volker Reinhold has been the concertmaster of the Mecklenburg State Orchestra, which performs operas, operettas, musicals, ballets, and concerts at the Mecklenburg State Theater in Schwerin, Germany. According to his Web site, Mr. Reinhold "has gone on to perform a wide range of solo assignments and to dedicate himself intensively to chamber music. Additionally, for some years he has often assisted as a concertmaster with several Northern German orchestras. He has a special predilection for the virtuosic violin literature, above all Fritz Kreisler and also Pablo de Sarasate. He has incorporated practically all of the former's music into his repertoire. For many years he has performed successfully with his regular piano partner Ralph Zedler. Mr. Reinhold performs on a 'Mougeot,' a French violin from the nineteenth century." 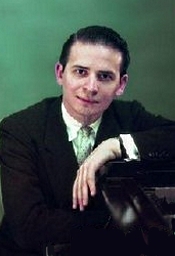 "In 1999 pianist Ralph Zedler graduated from Staatliche Hochschule für Musik in Cologne. He worked regularly in the singing classes of Liselotte Hammes, Klesie Kelly, Kurt Moll, Edda Moser. From the autumn of 1999 to January 2011 Mr. Zedler was engaged at the Mecklenburg State Theatre in Schwerin as soloist and Ballettrepetitor, participating in over seventy productions of opera, operetta, musical, oratorio, and ballet. Since 2011 he has worked at capital Opera, the smallest Opera Berlin devoting himself to the repertoire of forgotten one-act plays. 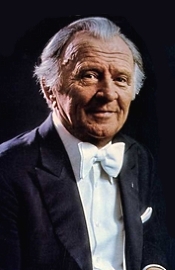 Mr. Zedler's concert career has taken him along with prominent figures such as singers Agnes Giebel, Ulrich Hielscher, Jean van Ree, and Edda Moser." 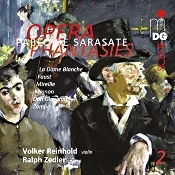 On the album under review, Reinhold and Zedler offer, as I say, seven more Sarasate fantasies. Since Sarasate loved to dazzle his audiences with his virtuosic pyrotechnics, what better way to do so than by playing some of his own transcriptions of already famous music. The program Reinhold and Zedler present here includes concert-fantasy arrangements for violin and piano of La Dame Blanche by Francois-Adrien Boieldieu; two fantasies on Faust by Charles Gounod; Mirelle by Gounod; Mignon by Ambrose Thomas; Don Juan (Don Giovanni) by Wolfgang Amadeus Mozart; and Zampa by Ferdinand Herold. Volker Reinhold plays a mean fiddle; yet he is no extrovert showman for its own sake. Now, understand, Sarasate arranged these pieces to show off his brilliant playing ability, so understandably there is going to be plenty of opportunity for any soloist to demonstrate his worth. But, as I say, while Reinhold is a consummate violinist, he never seems to want to draw too much attention to himself but rather to the music. This means that while you may find greater pyrotechnics from other violinists, you'll find none who demonstrate the value of the music better than Reinhold. In addition, Ralph Zedler's piano accompaniment always complements Reinhold's violin. There is neither a lagging letdown in Zedler's playing nor any attempt at upstaging. It is, after all, the violin that should be center stage in these pieces, and even though Zedler is an excellent pianist, he recognizes that it's his job to accompany the violin, which he does with admirable skill and attentiveness. The opening number, La Dame Blanche, is a good example of how the two men enrich one another's skills. When the violin comes to the fore, the piano gently recedes into the background and vice versa, each artist giving the other plenty of room to shine. Again, neither man tries to give a bravura performance, just an honest representation of the music. And that honesty works because the resultant performance is delightful. In Faust, by the time we get to the famous waltz segment, we get the charmer we have come to expect. Reinhold and Zedler don't try to force us to hear it in any other way than how we hope to hear it, lilting and light. There's no puffery about it, no attempt overemphasize it through excessive tempo or dynamic changes; it's just beautiful music, pure and simple. And so it goes. Each selection is delectable, as we might anticipate from Sarasate and from the two performers. The Gavotte from Mignon has an appropriate cockiness; Don Juan is dramatically musical, even if Sarasate purposely left out some of the opera's more-familiar music; and Zampa is alternately tranquil, passionate, and stirring. Mr. Reinhold and Mr. Zedler fill out the disc with a generous seventy-seven-plus minutes of material, and the label, MDG, provide the disc with some attractive cover art. Producers Werner Dabringhaus and Reimund Grimm and recording and mixing engineer Holger Schlegel recorded the music at the Konzerthaus der Abtei Marienmunster in February 2015. Yet again they made the album in just about every audio format you can think of on a single disc: CD, SACD, DVD, 2.0, 5.1, and 2+2+2. That last one still puzzles me. It appears that 2+2+2 utilizes all six channels on an SACD layer to present music not just in two channels front and two channels back but two channels up and down as well. So 2+2+2 captures all the reflected sound of a musical event in true three dimension. However, I have my SACD player hooked up only to two channels, so that's the way I listened, in two-channel SACD. The instruments appear at a modest distance, providing an ultraclean sound, and there is a modicum of room reflection to dampen any hint of hardness or brightness that might otherwise creep into play. There is also a good sense of the two performers being side by side instead of miked too far apart for a greater (but not as realistic) stereo spread. The sound is slightly warm, full, resonant, and, in fact, quite natural. Tuesday, December 1, 2015, 7:30 p.m.
Sunday, December 6, 2015, 2 p.m.
Thursday, December 10, 2015, 7:30 p.m.
Friday, December 11, 2015, 8 p.m.
Friday, December 18, 2015, 8 p.m.
Saturday, December 19, 2015, 2 p.m. and 5 p.m. In programming the Cal Performances 2015–2016 season, Executive and Artistic Director Matías Tarnopolsky curated three thematic strands—ZellerBACH, The Natural World, and ReVisions—to draw connections between performances across artistic genres and to encourage the reimagining of conventional performing arts. The ReVisions strand features three artists whose multi-disciplinary work challenges genre stereotypes and performance practices; in doing so, it speaks uniquely to our cultural moment. The contemporary music laboratory Ensemble Intercontemporain, led by Music Director Matthias Pintscher, makes a rare visit from Paris for the U.S. premiere of UC Berkeley composer Edmund Campion's Cluster.X, featuring video by Kurt Hentschläger, and the US premiere of a new work by fellow faculty member Franck Bedrossian, among other works by Boulez, Pintscher, and others. The innovative Texas-based theater group the Rude Mechs performs its acclaimed production Stop Hitting Yourself in its West Coast premiere. Finally, in his first national tour, dance-theater artist Trajal Harrell presents his multifaceted new work, The Ghost of Montpellier Meets the Samurai, in its West Coast premiere. Ensemble Intercontemporain performs on Friday­­–Saturday, November 6–7 at 8:00 p.m. in Hertz Hall. The Rude Mechs perform on Thursday–Saturday, November 19–21 at 8:00 p.m. and Sunday, November 22 at 3:00 p.m. in the Zellerbach Playhouse. Trajal Harrell's work is performed on Friday, March 18 at 8:00 p.m. and Saturday, March 19 at 2:00 p.m. in the Zellerbach Playhouse. Harrell will also be in residence at Cal Performances November 12-16, where he will participate in activities with UC Berkeley's Dance Studies Working Group and the Arts Research Center, among other activities. Tickets for Ensemble Intercontemporain on Friday­­ & Saturday, November 6& 7 at 8:00 p.m. in Hertz Hall are $76.00. Tickets for the Rude Mechs on Thursday–Saturday, November 19–21 at 8:00 p.m. and Sunday, November 22 at 3:00 p.m. in the Zellerbach Playhouse are $76.00. Tickets for Trajal Harrell on Friday, March 18 at 8:00 p.m. and Saturday, March 19 at 2:00 p.m. in the Zellerbach Playhouse are $48.00. All ticket prices are subject to change. Half-price tickets are available for UC Berkeley students. Tickets are available through the Ticket Office at Zellerbach Hall, at (510) 642-9988, at www.calperformances.org, and at the door. For more information about discounts, go to http://calperformances.org/buy/discounts.php. "Through adversity comes opportunity" might well be the unofficial motto of the American Boychoir School (ABS). Having filed for Chapter 11 bankruptcy protection in April, ABS was confronted with a painful reality: redesign the school's operational approach and secure the necessary funding to assure long-term stability, or close its doors. With a storied educational and performance legacy at stake, the school's leadership, faculty, students, parents and the community-at-large united in an unprecedented effort to not only keep the doors open, but to position the school and its revered choir for the future. Under its new operating structure, the Princeton, N.J., area will remain the school's home. A new location was secured at the Rambling Pines campus in Hopewell, a short distance from downtown Princeton. This vibrant campus offers the boys classrooms, rehearsal space and over 200 acres of outdoor play area. In addition, "Music Together," a non-profit organization dedicated to bringing music to children, has graciously made available additional rehearsal space at its global headquarters two miles away from our campus. The Seattle Symphony Piano Competition jury awarded First Prize in the Piano Competition to Canadian-born Kevin Ahfat. Due to the incredibly high quality of the other two finalists, the jury decided to award Second Prizes to both Kenny Broberg of Minnesota and Vijay Venkatesh of California. No third prize was awarded. Additionally, Kenny Broberg won the Audience Favorite Award. Of 20-year-old Kevin Ahfat's performance during the Symphony's Opening Night Concert on Saturday night, The Seattle Times remarked: "First-prize winner Ahfat attacked the last movement of the challenging Barber Piano Concerto in a manner that left no question about his riveting presentation and technical finesse." Last week, David Osenberg, music director of The Classical Network, wwfm.org, opened the fifth season of the station's popular "Celebrating Our Musical Future" series with the broadcast premieres of Young People's Chorus of New York City's five newest Radio Radiance commissions. The hour-long special of YPC's performances was recorded live in partnership with Mr. Osenberg and The Classical Network at SubCulture this past April, and was hosted by WNYC's John Schaefer. In addition to live performances of the works by YPC conducted by Artistic Director Francisco J. Núñez, the broadcast also includes interviews by WNYC's John Schaefer with each of the Radio Radiance composer -- Samuel Adler, Ryan Lott, Caroline Mallonée, Frank J. Oteri, and Aaron Siegel. YPC chorus members Isabel, Zoe, Alex, and Louisa are also interviewed. YPC choristers Bryanna, Maya, Olivia, Zacchariah, and Galen were interviewed on another WWFM program: "Cadenza," the recipient of a 2014 Deems Taylor/Virgil Thomson Award for Broadcasting. This program hosted by David Osenberg was devoted entirely to the music of Samuel Adler and included Mr. Adler's "Songs of the Seasons" commissioned from him by YPC for Transient Glory in 2004. Dubbed "America's most wired composer" by the Los Angeles Times, Tod Machover, premiered the fourth installment of his city symphonies "A Symphony for Lucerne" on Sept. 5 to thunderous ovations and tremendous critical acclaim. Machover served as this year's Composer-In-Residence at the internationally renowned Lucerne Festival, where four significant premieres - three world and one European - were presented. About his residency, Machover states, "What a powerful and rewarding experience to present so many different aspects of my work in such a concentrated period and under such superb conditions. Being Composer-In-Residence at this summer's Lucerne Festival allowed me to bring many ideas to fruition, and to try some completely new things as well. Transformative and unforgettable." Willi Boskovsky, the Johann Strauss Orchestra of Vienna. Warner Classics 0094638152422 (2-disc set). According to what I've read about Austrian violinist and conductor Willi Boskovsky (1909-1991), his orchestras didn't particularly like him as a music director. Nevertheless, from playing violin with the Vienna Philharmonic he went on to leading the orchestra in music largely of Johann Strauss in the Fifties, and audiences adored him, which is all that mattered. His Decca recordings from those early years are still among the yardsticks by which people judge Strauss music today. By the early Seventies, however, he was recording for EMI with the Johann Strauss Orchestra of Vienna, and he re-recorded most of the major Strauss repertoire for them. Then, when digital entered the scene, he re-recorded them yet again. You might say he became a specialist in the field. 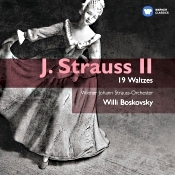 What we have in this 2007 rerelease from Warner Classics of the original EMI set is a collection of nineteen of Strauss's most famous waltzes from the early digital age of the Eighties. Interestingly, many of these digital recordings are more sprightly and open than his analogue recordings with the same orchestra had been a decade before. The digital sound is less warm and less full, true, but the sound is a bit more detailed and carries with it little obvious digital brightness or edginess. More important, the performances themselves are a fraction quicker and more spontaneous, a delight in every way, almost matching his Decca renditions of much earlier. Although, to be fair, I still think the Vienna recordings are richer and more elegant than any of Boskovsky's later productions. Among the nineteen waltzes on these two Warner discs are practically everything you've ever heard of: "The Blue Danube," of course, "Roses from the South," "Vienna Blood," "Voices of Spring," "Artist's Life," "Tales from the Vienna Woods," "Emperor Waltz," "Morning Papers," "Accelerations," "Lagoon Waltz," "Du und Du," "Wine, Women and Song," "Danube Maiden," and a few you might not have heard of like "Literary Essay," "Leading Article," "Pamphlets," and "Flight of Fancy." It's a terrific collection of waltzes, really, at an incredibly reasonable price. One minor concern, though. The booklet lists "Tales from the Vienna Woods" as being recorded with Rudi Knabl on zither, and the booklet article notes the piece "with its important part for the zither." But not here; there's not a zither in sight or sound. The original EMI booklet notes correctly list the work's recording date as 1982, but in that recording Boskovsky chose to bypass the zither and use a violin. At the time of putting together this collection, EMI must have been thinking of Boskovsky's 1985 recording, which I had on hand, where he reinstated the instrument with Mr. Knabl playing it. I can only guess that the mix-up was an oversight on EMI's part, a confusion not hard to understand given that Boskovsky recorded "Tales" at least four times in stereo: 1963, 1972, 1982, and 1985. I prefer the zither, by the way, but other than that there is no reason not to enjoy the set fully. Thierry Fischer, Utah Symphony. Reference Recordings Fresh! FR-715 SACD. 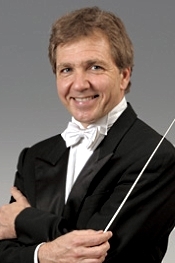 Since 1997 the Swiss conductor and flutist Thierry Fischer has been the chief or principal conductor of the Netherlands Ballet Orchestra, the Ulster Orchestra, the BBC National Orchestra of Wales, the Nagoya Philharmonic Orchestra, and as of 2009 the Utah Symphony. His most-illustrious predecessor in Utah was Maurice Abravanel, who recorded a well-received Mahler cycle that included a particularly good Mahler First. In commemoration of Maestro Abravanel, among the first things Fischer chose to perform was a complete Mahler cycle himself, and this is perhaps why he has recorded this new disc of Mahler's First. 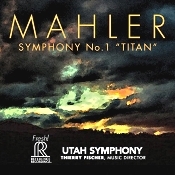 One assumes it may be the beginning of his own new cycle of Mahler recordings with the Utah orchestra. Anyway, Austrian composer and conductor Gustav Mahler (1860-1911) premiered his Symphony No. 1 in D major in 1889, saying at first it was a five-movement symphonic poem and, at least temporarily, giving it the subtitle "Titan." It was not long, however, before he revised it to the familiar four-movement piece we know today and dropped the "Titan" business. The work became especially popular in the mid-to-late 1950's, the beginning of the stereo age, I'm guessing because with its large orchestra, soaring melodies, enormous impact, and dramatic contrasts the symphony can make a spectacular listening experience, and it became a perfect way for audiophiles to show off their new stereo systems. In addition, we must not forget that the First is one of Mahler's shortest symphonies, making it a good length for home listening. In his Symphony No. 1 Mahler explained he was trying to describe his protagonist facing life, beginning with the lighter moments of youth and proceeding to the darker years of maturity. In the first movement, then, "Spring without End," we see Mahler's young hero as a part of the symbolic stirring of Nature before a long spring. Under Fischer, the coming of spring unfolds at a comfortable rate, unhurried but somewhat perfunctory. Then, too, Fischer keeps his tempos on the modest side, but doesn't vary them quite enough to provide a needed contrast. When spring finally does come into full bloom, it seems something of an afterthought. Dynamic levels, while strong, also appear a touch on the same side, so, again, there isn't a whole lot of contrast, even at the end where things should erupt with a bit more passion than heard here. In other words, Fischer's first movement didn't affect me the way other conductors have (Solti, Horenstein, Kubelik, Mackerras, Haitink, Bernstein, to name a few). In the second-movement Scherzo, "With Full Sail," we find Mahler in one of his mock-sentimental moods, displaying an exuberance that he may have meant as ironic. Things here look up for Fischer, where he seems to be having a little more fun, particularly in the lovely middle segment. Still, there seems a certain element of calculation to the music making, which tends to hold it back from full realization. In the third movement we get an intentionally awkward funeral march depicting a hunter's fairy-tale burial, which comes off as a typical Mahler parody. It might represent the hero's first glimpse of death or maybe Mahler's own recollection of a youthful encounter with the death of a loved one. With Mahler, who knows. The movement has long been one of the composer's most controversial, and audiences still debate just what he was up to. Whatever, Fischer's rendering of the funeral march is a rather somber affair and tends lack some of the macabre humor we find in other conductor's handling of the piece. Which conductor is more correct or closer to Mahler's intentions in this regard I have no idea; Fischer's approach just appeared somewhat leaden to me. Then, in the finale, Mahler conveys the panic "of a deeply wounded heart," as his central figure faces the suffering of life and fate. Still, because Mahler was a spiritual optimist, he wanted Man to triumph in the end. Therefore, in the final twenty minutes or so Mahler pulls out all the stops and puts the orchestra into full swing. It is only in this finale, though, that Fischer seems to take things a bit too quickly. Nevertheless, it is undoubtedly a thoughtful interpretation, the momentary confusions well realized despite the orchestra all aswirl, the whole thing ending in an appropriate triumph. Again, however, I didn't hear enough gradation in the volume of various parts of the score to emphasize the music's differences. So it all tends to come at the listener in a slightly unvarying, slightly humdrum manner. The Soundmirror production team of producer Dirk Sobotka, recording engineer John Newton, and mixing and master technician Mark Donahue made the recording live at Maurice Abravanel Hall in Salt Lake City, Utah, in September 2014 as a part of the Reference Recordings Fresh! series. Soundmirror chose 5 DPA 4006 microphones as their main array, supplementing them with "spot mics" to clarify the detail of the orchestration. Moreover, they made the recording for hybrid SACD playback, so you can listen to a two-channel or multichannel SACD layer if you have an SACD player and a two-channel CD layer if you have only a regular CD player. I listened to the two-channel SACD layer. The sound is good, with the only fly in the ointment for me being the "live" part of the recording. As I keep repeating in these pages, I have seldom heard a live recording I didn't think would have sounded better recorded in a studio or without an audience present. That goes for this one, too. Of course, the miking has to be relatively close in order to minimize audience noise, yet here it is not so close as it is in many other live recordings. The result is a fairly natural perspective if you're sitting close to the orchestra. Unfortunately, there are times when individual instruments appear too close for realism's sake, even though there are other times when a lifelike sense of orchestral presence seems evident. Dynamics are strong, frequency response reasonably wide (with a solid deep bass), and transparency good without being bright or hard. Overall, the sonics are round, warm, detailed, and natural, as though heard from a moderate distance instead of so close up. The audience, by the way, is very quiet; you won't hear a peep, a cough, or a rustle from them. And the disc's producers have mercifully edited out any closing applause. Finlandia and others. Herbert von Karajan, Berlin Philharmonic. Warner Classics 0724347684623. One of the nice things to come out of Warner Classics taking over the EMI catalogue is that Warner has started reissuing some of the classic titles from the EMI ranks. This rerelease of Sibelius tone poems from Herbert von Karajan and the Berlin Philharmonic is a good example: The performances are first-rate; the disc includes two more selections than found on the LP; the sound is quite good; and the mid price is welcome. Unfortunately, it doesn't appear the folks at Warner knew what to call the collection once they put it together. The old LP simply listed on the front cover the tone poems it contained. This reissue uses the original LP artwork, so it's a little misleading by not having all the CD's titles on it. Additionally confusing, the CD spine calls the album "Famous Tone Poems," while the disc itself says "Popular Tone Poems." Growing pains, I suppose, as Warner Classics finds its way; eventually, I'm sure the left hand will know what the right hand is doing. In any case, the slight confusion in labeling doesn't diminish the quality of the music or the music making. Karajan and his Berlin players are in top form as they offer up six short Sibelius works, pieces they would record two or three times for DG and EMI before Karajan's passing. 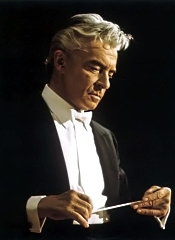 Herbert von Karajan was among the most-popular conductors of the twentieth century, particularly leading the Berlin and Vienna Philharmonic Orchestras. However, that didn't mean that everybody loved him, and his critics often complained that he often glamorized the music he was playing with his flowing tempos and luxuriant orchestral sound. Anyway, love him or leave him, Karajan had a special affinity for the music of Finnish composer Jean Sibelius (1865-1957), as this disc demonstrates. First up on the program is En Saga, from 1892 Sibelius's first purely orchestral work. It doesn't appear to have any specific story behind but, rather as Sibelius explained, "En Saga is the expression of a state of mind. I had undergone a number of painful experiences at the time and in no other work have I revealed myself so completely. It is for this reason that I find all literary explanations quite alien." Under Karajan the music conveys a strong harmonic structure. While maybe it doesn't project as much atmosphere as some other recordings or as much excitement, it has a taut yet resilient integrity and a somewhat brisk pace that make for a powerful narrative, and Karajan's handling of the slower parts is really quite fetching. 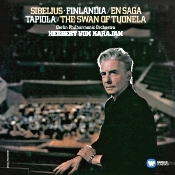 Next is the lovely Swan of Tuonela, made even more appealing under Karajan's loving guidance. Sibelius wrote it in 1895 as a section of the Lemminkäinen Suite, four legends from Finnish mythology. Like his earlier DG account, the performance is fluid and serene in almost majestic terms. With Karajan's fondness for poetry and the orchestra's opulent, luxurious effect, the piece sounds quite lovely. After that is a selection not included on the original LP: the Karelia Suite from 1893. Its three movements are a jaunty, marchlike Intermezzo; a medieval Ballade; and a rousing Alla Marcia. Here, the grandeur of the Berlin orchestra really comes to fore. Even if the music itself may be a little bombastic, Karajan and his players infuse it with an impressive richness, and again the conductor handles the slow movement with a deft hand. Then, we get probably Sibelius's single most famous piece of music, Finlandia, a patriotic piece written in 1899 as a protest against increasing Russian censorship in Finland (the country was at the time under the rule of the Russian Empire). Karajan's way with this familiar music is almost overwhelming. It's not the most subtle approach, but it is undoubtedly just what such vigorous music demands: strong, uplifting, and magnificently performed. Valse triste is another track not found on the original LP. Sibelius composed it in 1903 as a part of the incidental music for a play by his brother-in-law. Today, though, we mostly know it for itself. Karajan takes it at a rather slow, almost gloomy pace, bringing out the melancholy element of the music more so than many other conductors. Given the nature of what the music represents in the play (a dying woman mistaking death for her husband), the conductor's approach seems entirely appropriate. The album concludes with Tapiola, Sibelius's last major work, premiered in 1926. The music depicts Tapio, a spirit or god of the forest in Finnish legend, and the tone poem describes the forest in which Tapio lives. This is the most atmospheric of Karajan's Sibelius. The conductor's tempos are broad and the rhythms sweeping. He builds a most-evocative picture of the god and his misty, snowy, desolate northern woods. The storm section is especially thrilling as it arises from the quiet that precedes it. Producer Michel Glotz and engineer Wolfgang Gulich recorded the music at the Philharmonie, Berlin in 1976, 1980, and 1981. According to the Warner booklet notes, this disc uses the Abbey Road remasterings from 2002 and 2005, so if you already have EMI's issues from back then, these should sound the same. There's a fairly balanced frequency response involved; good, though seldom extreme, dynamics; some small degree of warmth but with decent detail; and moderately good lows and highs. These are relatively clean, clear recordings, in fact, although perhaps a trifle hard in the upper midrange, hardly noticeable. Cal Performances celebrates the 50th Anniversary Tour of American iconoclast choreographer Twyla Tharp with three performances, featuring two Bay Area premieres, Friday and Saturday, October 16 and 17, at 8:00 p.m., and Sunday, October 18, at 3:00 p.m. in Zellerbach Hall, Berkeley, CA. Instead of creating the expected for her milestone tour--a retrospective of her greatest hits--Tharp's restless spirit demanded she choreograph new works. This Berkeley RADICAL residency showcases Tharp's vast and enduring career of creating dance that has famously bridged popular and classical forms, with two new works performed by a company of 13 dancers, many of whom have worked with her for years. Preludes and Fugues (Bay Area premiere) is set to J. S. Bach's The Well-Tempered Clavier and presents the world as it ought to be, balanced and in sync. Yowzie (Bay Area premiere) presents the world as it is, and is steeped in the energetic rhythms of early jazz, with music by Jelly Roll Morton and Fats Waller, among others, arranged and performed by Henry Butler and Steven Bernstein. Both premieres are introduced by a Fanfare, composed by John Zorn with choreography by Tharp. 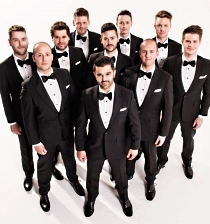 The Berkeley performances are part of a tour that begins in Dallas on September 18 and concludes at New York's Lincoln Center on November 17–22. Berkeley RADICAL residency activities are planned on the campus and in the community, including an Artist Talk by Twyla Tharp, followed by a signing of her latest book, The Collaborative Habit: Life Lessons for Working Together (2013), on Saturday, October 17, at 3:00 p.m. in Wheeler Auditorium; a Community Response Panel on the enduring attraction of Bach's music to creative artists on Saturday, October 17, at 5:30 p.m. in Wheeler Auditorium; and a Community Dance Class, featuring an artist with Twyla Tharp's company leading choreographic phrases from the current work on Saturday, October 17, at 11:00 a.m. in Bancroft Studio. All events are free and open to the public. Advance registration is highly recommended. RSVPs open on September 8. 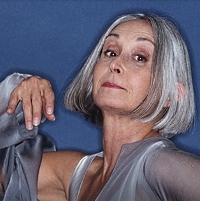 Tickets for Twyla Tharp's 50th Anniversary Tour on Friday­­ and Saturday, October 16 and 17, at 8:00 p.m., and Sunday, October 18, at 3:00 p.m. in Zellerbach Hall range from $40.00 to $96.00 and are subject to change. Half-price tickets are available for UC Berkeley students. Tickets are available through the Ticket Office at Zellerbach Hall, at (510) 642-9988, at www.calperformances.org, and at the door. For more information about discounts, go to http://calperformances.org/buy/discounts.php. The approaching 2015-2016 season for star tenor Lawrence Brownlee is perhaps his most exciting yet, including performances at four of the world's top opera houses, as well as a series of recitals around the U.S. Brownlee will open with a run of Rossini's La Cenerentola at the Lyric Opera of Chicago (his house debut), and then stars opposite his friend and colleague Joyce DiDonato in Rossini's La Donna del Lago at the New York Metropolitan Opera. From there, he flies to Paris to sing Rossini's Il Barbiere di Siviglia with Pretty Yende and Ildar Abdrazakov at the Opéra National de Paris, followed by a series of U.S. recital dates (including Wolf Trap), before capping the season with Bellini's I Puritani at the Opernhaus Zurich, once again opposite Pretty Yende. The past season had its fair share of exciting firsts as well – the extraordinary world premiere playing the lead role of Charlie Parker in Opera Philadelphia's YARDBIRD, a GrammyTM Award nomination for his critically-acclaimed Virtuoso Rossini Arias album on Delos Records, his nomination for "Male Singer of the Year" by the International Opera Awards, and most recently his first performance with conductor Gustavo Dudamel at the Hollywood Bowl. On Sunday October 11th, NYU Casa Italiana Zerilli-Marimò partners with Salon/Sanctuary Concerts to present a series of events commemorating a period in history when dialogue's light shined through walls of ignorance. In celebration of the 50th anniversary of Nostra Aetate, (the Papal declaration which condemned antisemitism in any form), and the visit of Pope Francis to the United States, From Ghetto to Cappella: Interfaith Explorations in the Music of Baroque Italy explores the cross-fertilization of Jewish and Catholic musical cultures that enriched the music of both Synagogue and Sanctuary in baroque Italy. Performers: Jessica Gould, soprano and Noa Frenkel, contralto; Diego Cantalupi and Diego Leveric, lutes; James Waldo, viola da gamba; Pedro d'Aquino, harpsichord and organ. Concert date and location: Sunday, October 11th, 4:00pm. The Fabbri Library of the House of the Redeemer, 7 East 95th Street, NYC. Joseph Rescigno will guest conduct Roosevelt's CCPA Contemporary Ensemble in its first concert of the 2015-16 season, on Friday, October 16 at 7:30 p.m. in the seventh-floor Ganz Hall of Roosevelt University, 430 South Michigan Avenue, Chicago, IL. The varied program of music from the 20th and 21st centuries will include Notturno Romano by Nicolas Flagello, with whom Maestro Rescigno studied, plus works by Luigi Dallapiccola, Milton Babbitt, Henry Cowell and Silvestre Revueltas. The concert also will include a world premiere, Infinite Gaze, by CCPA Associate Professor of Music Composition Dr. Kyong Mee Choi. The concert will be recorded for possible broadcast. "I've called the concert 'Midnight to Noontime'," says Maestro Rescigno, "because in a little over an hour, the music will trace a progression from night to day, from dark to light. "We start with Dallapiccola, in a Spanish village square in the middle of the night. We move to Rome for Flagello's version of night music. Dr. Choi's piece offers different views of the Earth and other celestial bodies from the perspective of deep space. Babbitt's work is not the least bit programmatic, but its sound world evokes the stars. We begin to see daylight with Cowell's Sinfonietta, which gets rather peppy, and end up in the sun with the revelry of the Revueltas, whose rhythms approach those of salsa." Friday, October 16, 2015 at 7:30 p.m.
Fort Worth Opera (FWOpera) proudly announced program details for a six-month long community conversation series titled JFK: 5 Decades of Progress. Beginning in October 2015 and culminating in the world premiere of FWOpera's JFK, the series will include five unique events focused on the presidential platforms of John F. Kennedy and the progression of those topics during the 50 years since his presidency. JFK: Five Decades of Progress will highlight a variety of important topics, policies, and events that helped define President Kennedy's time in office. From issues like Civil Rights, U.S foreign policy, and the Space Race to the evolution of journalism and government support of the arts, JFK: Five Decades of Progress will show how far – or not so far in some instances – the U.S has come since the President's time in Texas. "Fort Worth Opera prides itself on being an innovative leader on the stage, but with JFK: Five Decades of Progress, we hope to be a leader in the community as well, bringing relevant discussions to North Texas. It is my belief that art isn't just a form of entertainment, but a spark meant to ignite conversation and create change," stated General Director Darren K. Woods. Cultural and community leaders across the Metroplex have shown incredible support of FWOpera in this endeavor to engage our larger community in conversations beyond the opera stage. The organization has partnered with businesses across the metroplex including The Sixth Floor Museum, KERA, Fort Worth Metropolitan Black Chamber of Commerce, Fort Worth Hispanic Chamber of Commerce and more in an effort to bring these panel discussions directly into the communities and neighborhoods of North Texas residents. Tickets are free, but RSVPs are strongly encouraged. Reserve your seat by contacting 817.288.1227 or online at www.fwopera.org/events. Sacred Music in a Sacred Space's 2015-2016 N.P. Mander Organ Recital Series kicks off with Renée Anne Louprette and the NY premiere of a new Pamela Decker piece: October 18th, 3pm at New York City's Church of St. Ignatius Loyola. Sacred Music in a Sacred Space's N.P. Mander Organ Recital Series –set in the majesty of the Church of St. Ignatius Loyola – has established itself as a top "must do" event on New York's busy classical music and spiritual calendars. The four-part Mander Recital series kicks off with former Associate Director of Music at St. Ignatius, Renée Anne Louprette, on October 18, 2015, at 3:00 pm. For tickets and information, call 212-288-2520 or visit http://smssconcerts.org/site/concerts/upcoming-concerts/eventdetail/119/-/organ-recital-renee-anne-louprette. New Century Chamber Orchestra announced that it is a grantee recipient of Bloomberg Philanthropies' Arts Innovation and Management (AIM) program. Through the two-year initiative, Bloomberg Philanthropies is providing $30 million across 262 small and mid-sized nonprofit cultural organizations around the country to help strengthen their operational and programming efforts, including training in fundraising, audience development and board member engagement. "It is a great honor to be chosen by Bloomberg Philanthropies as a grantee of the AIM program," said New Century Chamber Orchestra Executive Director Philip Wilder. "This grant will give New Century both the financial and educational resources we need to bring the orchestra's unique artistry to a broader public, and to strengthen the health of our organization." First piloted in New York City, Bloomberg Philanthropies supported 245 grantees through AIM from 2011-2013. Participating organizations reported improvements in audience development, board engagement and fundraising over the two-year program. For more information on New Century, visit http://www.ncco.org. Inaugurating a season highlighted by the orchestra's commitment to empower and nurture aspiring young musicians and that continues the theme of innovation and exploration for which the orchestra has been celebrated in recent years, Music Director Ludovic Morlot and the Seattle Symphony will continue to explore diverse repertoire and engage with Seattle's creative community through innovative concerts and in-depth community and education programs. The season begins on September 19 and runs through July 2016. Ludovic Morlot leads the orchestra in 12 Masterworks programs this season with performances of core orchestral repertoire including Mahler's Symphony No. 1, Shostakovich's Symphony No. 4, Beethoven's Symphonies Nos. 3, 4 and 7, and Fauré's Requiem. In a programming philosophy that pairs standard repertoire with rarely heard orchestral works, the Orchestra's Masterworks season also includes the U.S. premiere of Silvestrov's Symphony No. 8, Berio's Sinfonia featuring vocal ensemble Roomful of Teeth, Messiaen's Poèmes pour Mi, Martinu's Symphony No. 4, and Dutilleux's Timbres, espace, mouvement. Ludovic Morlot embarks on a two-year Beethoven cycle starting this September, which will include all nine symphonies and all five piano concertos. This season Ludovic Morlot will conduct Symphonies Nos. 3, 4 and 7, and Piano Concertos Nos. 1, 3 and 4, featuring pianists Alexander Melnikov, Yefim Bronfman and Imogen Cooper, respectively. The Seattle Symphony names pianist Jean-Yves Thibaudet as its Artist in Residence for the 2015–2016 season. Thibaudet's residency will bring him to Seattle for various performances with the orchestra including as guest soloist for the Opening Night and Masterworks season concerts, a Distinguished Artists Recital, and in collaboration with Seattle Symphony musicians on the Chamber series, as well as teaching opportunities throughout the season. Also, Brahms: Violin Concerto. 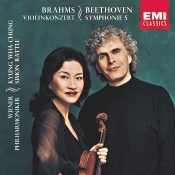 Kyung Wha Chung, violin; Sir Simon Rattle, Vienna Philharmonic Orchestra. EMI 7243 5 57165 2 1. Time was you would only get a single major repertoire item on an LP or CD, filled out if needed with one or two shorter pieces. Now, major labels think nothing of coupling the Beethoven Fifth Symphony with the Brahms Violin Concerto. It could have been a sign of the times when EMI released this disc in 2001; the music industry was slumping, and budget discs and remastered older material were the order of the day. The companies were doing anything they could to attract buyers. Here, EMI have given us some of the world's top performers in violinist Kyung Wha Chung, conductor Sir Simon Rattle, and the Vienna Philharmonic. The results are not unexpectedly impressive in many ways, yet they're strangely underwhelming in others. 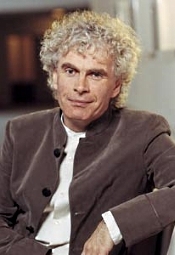 Much is made in the booklet notes about Rattle performing this live recording of the Beethoven from the Jonathan Del Mar edition of the score, a version that attempts to strip the music of all the barnacles and appendages that conductors added since Beethoven's day to accommodate new instruments and new styles. So it's a kind of "authentic," historical approach but without any period instruments. What this inevitably means is that the tempos are quicker, and certainly Rattle doesn't hold back; the textures are leaner, and despite the rich sonority of the orchestra, they are; and the sound is more transparent. But faster is not always better, and in the first movement, especially, Rattle's hell-bent-for-leather attack soon becomes a bit wearying. Don't get me wrong; it's not that it isn't thrilling because much of it is, and the Vienna Philharmonic continues to sound like one of the world's great ensembles. It's just that the performance becomes a little monotonous at so unvarying a pace, with Rattle showing little enthusiasm for the finer points of the music. However, after the first movement, the rest of the symphony fares better, actually becoming something near traditional by the end. The interpretation is different, to be sure, and rewarding in its own way, but it is still not so electrifying or so exciting as the renditions by, say, Carlos Kleiber (DG) or Fritz Reiner (RCA or JVC). Whatever, the Brahms concerto inhabits a slightly better world, and in at least one instance, a literally different world. Recorded in a studio, Ms. Chung produces an exceptionally exhilarating Brahms Violin Concerto. She storms, she rants, she rages through the monumental opening movement and then concludes it in a heartbreaking episode of sweetness and light. I like what Sarasate remarked when somebody asked him to play the piece; he said he declined on the grounds that he had no intention of listening, violin in hand, while the solo oboe played the only melody in the whole score. Well, the Brahms has never been my favorite concerto, either. In fact, every time I hear it I wonder if the violin is ever going to make its entrance at all. But in Ms. Chung's hands, it sounds rather captivating, at least for a while. She may exaggerate the stormier moments, but she handles the softer passages with such delicacy you can almost forgive her excesses elsewhere. EMI's sonics are pretty good for a live recording (2000) and even better in the studio (2001). The orchestra sounds leaner than usual in the Beethoven, thanks to the new edition, and the engineers take full advantage of the work's new clarity. The live sound is close but detailed. The stereo spread is wide, yet without leaving any holes in the middle. Ambiance is subtle but adequate for replicating a large environment. And in the concerto Ms. Chung's violin seems almost ideally balanced with the orchestral support. With at least an interesting Beethoven and a fairly nice Brahms, the disc makes a reasonably appealing though not entirely satisfying listening experience. Also, Grand Pianola Music. St. Lawrence String Quartet; Michael Tilson Thomas; John Adams; San Francisco Symphony. SFS Media SFS 821936-0063-2. It is isn't hard to see why American John Adams (b. 1947) is among the world's most-popular living classical composers. Wikipedia says "The music of John Adams is usually categorized as minimalist or post-minimalist although in interview he has categorised himself as a 'post-style' composer. While Adams employs minimalist techniques, such as repeating patterns, he is not a strict follower of the movement." No, more likely, people don't really categorize Adams; they simply like his stuff. He produces a kind of modern music that, dare I say it, audiences actually enjoy. I tease, of course, but it seems like a lot of modern classical composers resent listeners liking their music; it smacks too much of populism. What am I doing wrong? People like it. 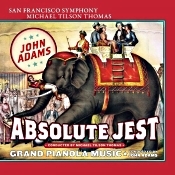 Well, Adams seldom does anything musically wrong, and here he gives us one of his newest works, Absolute Jest, along with another piece in a similar vein from thirty-odd years earlier, Grand Pianola Music. 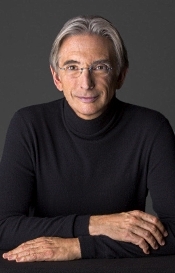 Michael Tilson Thomas leads the San Francisco Symphony in the newer work, while the composer himself leads the orchestra in the older one. The first work on the album is Absolute Jest (2013), which Adams describes as "a colossal twenty-five-minute scherzo in which I take fragments of Beethoven's music and subject them to my own peculiar developmental techniques, some of which I've derived over years of using 'radicalizing' musical software. The Beethoven ideas, mostly from the quartets Opus 131, 135, and the Grosse Fugue, are compact and succinct, lending themselves naturally to fantasy and invention. A swinging 6/8 figure reminiscent of the Seventh Symphony launches the piece, but this is interlaced with some famous 'tattoos' including the Ninth Symphony scherzo." Then music historian Larry Rothe adds, "Absolute Jest is post Minimalist Adams. The seed came when he heard Michael Tilson Thomas conduct Pulcinella, in which Stravinsky recast works by eighteenth-century Italian composers in his own musical language. Adams conceived a similar scheme, riffing on Beethoven scherzos. Beethoven's scherzos may be jokes, but Adams emphasizes they are jokes on a high plane. He loves the word 'jest,' derived from the Latin 'gesta,' a notable deed. A jest is not therefore by definition a thigh-slapper, nor is Absolute Jest a comedy." Rothe goes on to quote Adams: "To Beethoven, a scherzo is this inspired sense of movement and happiness. I wanted my work to be invested with that happiness." Although Adams may not have intended Absolute Jest as a comedy, one cannot help but smile when the music breaks out into familiar bits and pieces of Beethoven. And Tilson Thomas does not shy away from the music's wittier passages, making it sound like high, good fun. Adams wrote the piece in eight movements for orchestra and string quartet, the "Beginning" a lengthy, spacious, swooping affair, with intermittent hints of Beethoven, the most obvious coming from the Ninth Symphony. The remaining movements last about one to five minutes each, most of them more animated than the opening section, except for the somewhat eerie, haunting fourth segment. The music is easily accessible, and Tilson Thomas and company make it highly enjoyable. The second work on the disc is the Grand Pianola Music from 1982. Adams says of it, "...from the start I knew that I would have to shape my own language and find a way to get around Minimalism's rigor and endless pattern-weaving and form a language that was more dramatic and emotionally complex. ...Grand Pianola Music does it in a way that is not only meditative and trance-like, but also brash and picaresque." Adams divided this one into three parts (fast, slow, fast), although the entire work is about six minutes longer than the newer one. It appears a tad simpler and more repetitive than the newer work, too, with traces of Ives and even Copland in its structure and wordless vocals interspersed with piano solos and accompaniment (Orli Shaham). Like the music of Ives, you'll hear a little of everything here, from the aforementioned vocals and piano to marches, gospel, and church hymns. Of the final movement, Adams explains that it yields up "a tune that seems like an 'oldie,' the words for which no one can quite remember." It's quite a lot of fun, actually. Producer Jack Vad and engineers Roni Jules, Gus Pollek, Jonathan Stevens, and Dann Thompson recorded the music live at Davies Symphony Hall, San Francisco, CA in May 2013 and January 2015. They recorded it in 96kHz/24-bit audio (Absolute Jest) and PCM 192kHz/24-bit (Grand Pianola Music) for hybrid SACD two-channel stereo or multichannel playback. I listened to the two-channel stereo SACD track. Before I talk about the sound, however, I suppose for the benefit of those of you interested in live recordings, I should say a word about audience noise. For the most part, there isn't any. But there is applause. I say "but" because some listeners don't mind it, while for me it tends to draw my attention away from a performance. In this case, the disc's producers have edited out any applause between the two major works but left it in at the end. So, for me it's still annoying but at least not as annoying as it could have been. Now, to the sound: It's slightly less close than usual in a live recording, and hall reflections and long decay times appear more in evidence. If anything, the sound seems softer than I've heard it before from this venue and ensemble, and even more natural and easy on the ear. The orchestral spread is quite wide and natural, with a reasonable amount of depth; and the frequency response, while not exactly reaching the heights of the treble or depths of the bass sound more than adequate for the occasion. Byron Janis, piano; Charles Munch, Boston Symphony Orchestra. HDTT. 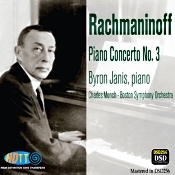 There has never been a lot of disagreement about Byron Janis's two primary stereo interpretations of the Rachmaninov Third Piano Concerto--the earlier, 1957 RCA account with Charles Munch and the Boston Symphony remastered here by HDTT (High Definition Tape Transfers) and the slightly later, 1961 Mercury version with Antal Dorati and the London Symphony. Listeners have enjoyed both recordings almost equally over the years and both have received strong critical acclaim. No, what disagreement there is comes in which of the two is actually better. There, you may get some argument, as taste differs. My own early introduction to the two Janis recordings came in the LP era, sometime in the mid Sixties. At that time, I favored the earlier rendering with Munch for its performance, which I found powerful yet still lyrical, and the one with Dorati for its cleaner, clearer sound. The "however" is that I could hardly stand to listen to Janis's RCA LP with Munch because of its bright edginess and noisy vinyl surface, and I thought Janis's Mercury performance with Dorati was a little too brash and reckless by comparison. So I was never completely satisfied with either LP. Now, we have the HDTT remastering of Janis/Munch, and all is right again with the world. I can have my cake (the Janis/Munch recording) and eat it, too (listen to it without fatigue). For those of you not fully acquainted with Mr. Janis, his Web site describes him thusly: "Byron Janis is internationally renowned as one of the world's greatest pianists. He made his orchestral debut at age 15 with Toscanini's NBC Symphony Orchestra and, the following year, was chosen by Vladimir Horowitz as his first student. At 18, he became the youngest artist ever signed to a contract by RCA Victor Records. Two years later, in 1948, he made his Carnegie Hall debut which was hailed as an unparalleled success. He has played with every major symphony orchestra in both the U.S. and abroad. "Mr. Janis was the first American artist chosen to participate in the 1960 Cultural Exchange between the United States and the Soviet Union and was hailed on the front page of The New York Times as, 'an ambassador in breaking down cold war barriers.' His many recordings appear on the RCA and Mercury Phillips labels. His two latest recordings for EMI are 'Byron Janis Plays Chopin,' which received National Public Radio's 'Performance Today Critics Choice Award' and the Chopin/Liszt CD 'Byron Janis True Romantic.'" As far as the music goes, the Russian pianist, composer, and conductor Sergei Rachmaninov (1873-1943) wrote his Piano Concerto No. 3 in D minor in 1909, and it quickly picked up a reputation for its difficulty in playing. Today, however, most pianists take it in stride, and there are any number of fine recordings of it, Janis's among them. Janis's interpretation is basically a lyrical one, although he is fully up the big virtuosic parts, too. Yet, as I say, he seems a touch more in control with Munch than he does in his later Mercury recording with Dorati. Moreover, Munch and the Boston Symphony provide him with a matchlessly fluid, velvety accompaniment coated with splashes of Romantic color. This is a performance with no sign of grandstanding yet one that keeps you riveted with its poetic insight and beauty. In fact, Janis's is an astonishing performance, one that anybody interested in this work owes it to himself to hear. It may not quite sizzle the way Argerich's account does or Horowitz's or the composer's own (mono), but it makes up for it by being better proportioned than most, combining the right amount of vigorous showmanship and flourish it needs with the melodic introspection so necessary, too. I love the performance, and now I love the sound. It's a winning recording. Drawbacks of the HDTT disc? Only the same one I've mentioned before about HDTT's products. Namely, they most often provide just the material found on the original tapes or LP's and nothing more. While it has become common practice among most of the record companies these days to include two Rachmaninov concertos on a single CD, the folks at HDTT give us merely the one concerto, which lasts but a little over thirty-seven minutes. Still, if it's simply the concerto you want, you won't find it sounding any better than here. RCA recorded the concerto in 1957, and HDTT remastered it in DSD (Direct Stream Digital) from an RCA 15ips 2-track tape. Sonically, this is nothing like the old LP I remember. This remastering is smooth and natural, with a pleasingly resonant warmth that gives it a realistic ambience. I love the sound, the Boston Symphony spread out widely behind the soloist, the pianist well integrated into the surroundings and not too far out in front of the other players as so often happens in concertos. Frequency balance, dynamics, and overall clarity are also quite good, so anyone, like me, who recalls the old LP as being too bright or hard or edgy should have no fears about this remaster. Cal Performances Executive and Artistic Director Matías Tarnopolsky curated three thematic strands when programming the 2015–2016 season. The first, called ZellerBACH, features a series of performances and public programs to explore the lasting musical legacy of Johann Sebastian Bach. American iconoclast Twyla Tharp celebrates a half-century of creating ambitious, complex dance works that embrace and extend the American vernacular, with her 50th Anniversary Tour, featuring new works set to John Zorn, New Orleans jazz, and Bach's The Well-Tempered Clavier. The Baroque chamber orchestra and choir Bach Collegium Japan, directed by Masaaki Suzuki, are pioneers of period-instrument performance in its home country, performs an all-Bach program. And violinist Gil Shaham plays Bach's complete Sonatas and Partitas for solo violin, with new projections by acclaimed visual artist David Michalek. Performances of Twyla Tharp's 50th Anniversary Tour are Friday­­ and Saturday, October 16 and 17 at 8:00 p.m., and Sunday, October 18 at 3:00 p.m. in Zellerbach Hall. Bach Collegium Japan performs on Saturday, October 24 at 8:00 p.m. in First Congregational Church, and Gil Shaham takes the stage in Zellerbach Hall, with films by David Michalek, on Thursday, April 14 at 8:00 p.m. in Zellerbach Hall. 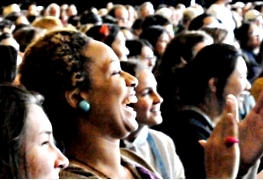 In February 2015, Cal Performances unveiled Berkeley RADICAL (Research And Development Initiative in Creativity, Arts, and Learning), its new project to cultivate the artistic literacy of future audiences and to connect the world's most innovative artists with the intellectual capital of the UC Berkeley campus. Through carefully crafted public programs and creative artistic residencies, Berkeley RADICAL serves as a framework to expand the reach of Cal Performances by providing audiences with multiple access points to a single work of art or artist. In addition to the performances, ZellerBACH programs include pre-performance talks, and a community response panel exploring the dynamic attraction of Bach's music for contemporary artists and audiences. For more information as events are announced, visit http://calperformances.org/learn/berkeley-radical/programs.php. Tickets for Twyla Tharp's 50th Anniversary Tour on Friday­­–Saturday, October 16–17 at 8:00 p.m., and Sunday, October 18 at 3:00 p.m. in Zellerbach Hall, University of California at Berkeley, range from $40.00 to $96.00. Tickets for Bach Collegium Japan on Saturday, October 24 at 8:00 p.m. in First Congregational Church, Berkeley, CA, are priced at $52.00. Tickets for Gil Shaham with films by David Michalek on Thursday, April 14 at 8:00 p.m. in Zellerbach Hall, range from $36.00 to $86.00. All ticket prices are subject to change. Half-price tickets are available for UC Berkeley students. Tickets are available through the Ticket Office at Zellerbach Hall, at (510) 642-9988, at www.calperformances.org, and at the door. For more information about discounts, go to http://calperformances.org/buy/discounts.php. Music Director Joana Carneiro and Berkeley Symphony have announced programming for the 2015-2016 season, including the West Coast premiere of Laterna Magica by Kaija Saariaho, who will be a visiting music professor at UC Berkeley this fall; the West Coast premiere of Mark Grey's new Frankenstein Symphony, co-commissioned with the Atlanta Symphony Orchestra; and the U.S. premiere of Fachwerk by Russian composer Sofia Gubaidulina, featuring the Bay Area debut of Geir Draugsvoll, a pioneer of the bayan, or classical accordion, for whom the work was written. The Orchestra also welcomes soprano Simone Osborne, and violinist Simone Porter, both making their Bay Area debuts, in addition to a first-time Berkeley Symphony appearance by pianist Conrad Tao. Well-established as a presenter of major contemporary orchestral works, Berkeley Symphony continues its steadfast commitment to presenting original and unique programs, with a 2015-2016 season that combines important contemporary works, U.S. and West Coast premieres, and commissioned work alongside classic masterworks. In addition to the aforementioned premieres, this season Berkeley Symphony will explore classics including Berlioz's Les nuits d'été, featuring soprano Simone Osborne; Tchaikovsky's Violin Concerto in D major, featuring Simone Porter; Beethoven's Piano Concerto No. 5 ("Emperor"), with Conrad Tao as soloist; Beethoven's Overture to The Creatures of Prometheus; Ravel's Bolero; Mussorgsky's Pictures at an Exhibition; Lutoslawski's Concerto for Orchestra, and Gabrieli's Canzon septimi et octavi toni and Sonata pian e forte for brass. Tickets to all of Berkeley Symphony's 2015-2016 concerts are on sale now at www.berkeleysymphony.org; by phone at (510) 841-2800, ext. 1; by fax to (510) 841-5422; or by mail at 1942 University Avenue, Suite 207, Berkeley, CA 94704. 2015-2016 season subscriptions to the Zellerbach Hall Concert Series (four concerts) are also available. Prices for the four-concert series range from $39 to $266. Subscribers enjoy a 10% discount on additional single ticket purchases throughout the season. Single ticket prices range from $15 to $74. Groups of 6 or more receive a 20% discount off the single ticket price. Berkeley Symphony offers a $7 Student Rush ticket one hour prior to each performance for those with a valid student ID. On September 27th, the cutting edge classical music series Tertulia Chamber Music will launch its fourth season at Chinese-Spanish fusion hotspot Tasca Chino with a unique all-wind program, further continuing their commitment to presenting world-class artists and innovative programming at an eclectic array of restaurants around New York City. In an unparalleled initiative, Tertulia's 2015-2016 season will also include the expansion of the series to San Francisco, with a debut concert featuring the St. Lawrence String Quartet. As the series' mission continues to attract new and experienced classical music audiences and foodies alike, Tertulia's incomparable concerts place chamber music back where it belongs - in a festive, inviting atmosphere. Tertulia is not your typical classical music presenter. Established in 2011 by Artistic Director Julia Villagra, Tertulia is a chamber music series that is designed to attract new and experienced audiences alike, or really, anyone who loves incredible food and music. Part concert, part dinner party Tertulia presents world-class chamber music concerts in critically acclaimed restaurants in and around New York City. The format and program is designed to enhance the social and culinary experience, but at all Tertulias, the music is paramount. Executed in a dynamic, casual format, Tertulia allows the audience to socialize over dinner and drinks while still adhering to a concert-like set of rules: there is absolutely no talking or moving around and restaurant service is suspended during performances. In its 2014-2015 season, Tertulia welcomed celebrated artists and ensembles including Jennifer Johnson Cano, The Dover Quartet, harpist Bridget Kibbey, cellist Nicholas Canellakis, the Jasper String Quartet, countertenor Anthony Roth Costanzo, the Tesla Quartet and more. The Brown and Breen Piano Duo and didgeridoo player Russell Smith give a free concert of rarely-performed works by Australian composers. The group performs Peter Sculthorpe's last composition, "Island Songs," for the first time in the U.S. on September 25 at Symphony Space, NYC, along with works by Percy Grainger, Elena Kats-Chermin, and Miriam Hyde. This program forms the basis for Brown and Breen's forthcoming album, also titled Island Songs. Formed in 2011, the Brown and Breen Piano Duo has mastered an extremely wide range of music for piano duo and piano four-hands, spanning the greatest composers of the classical canon. However, their collaboration has also been a vehicle for acclaimed Australian pianists Bonnie Brown and Louisa Breen to champion the music of their country, especially the works of contemporary composers. These are the works that Brown and Breen have chosen to share with American audiences on their first tour of the United States. Young People's Chorus of New York City (YPC) is pleased to announce its first grant from the Howard Gilman Foundation. The grant of $75,000 was issued to YPC for its New Music for New Audiences contemporary music programs, as well as for general support of the organization. Upon receiving the grant, Francisco J. Núñez, artistic director and founder of YPC, said: "We are enormously grateful to the Howard Gilman Foundation for its remarkable generosity. This support will help YPC continue to expand the reach and awareness of new music throughout New York City and beyond, and foster an environment of creativity, innovation, and excellence among young people." New music projects supported by this grant during the 2015-16 season include YPC's Transient Glory and Radio Radiance series, which since 2001 have commissioned more than 80 pieces of music for young voices from today's most distinguished composers, making an important impact on the ever-evolving landscape of music in the 21st century. All commissions are integrated into YPC's standard repertoire and are performed by the chorus as part of its programming in concerts, on tour, on recordings, and in competition. YPC's 2015-16 season begins with a performance that the whole world will be watching. YPC is privileged and honored to be invited to sing for Pope Francis at the World Trade Center as part of his first visit to the United States. At 11:30 a.m. on Friday, September 25, Pope Francis will visit the 9/11 memorial site for a multi-religious meeting for peace, where the YPC choristers will perform. YPC makes its BAM Next Wave Festival debut in the world premiere of Epiphany: The Cycle of Life, a co-production between YPC and VisionIntoArt. It takes place in four performances from November 4 to 7. Radio Radiance Broadcast Premiere: September 14 on WWFM, The Classical Network. This broadcast premieres of the five new 2015 Radio Radiance works by composers Samuel Adler, Ryan Lott, Caroline Mallonée, Frank J. Oteri, and Aaron Siegel will air on WWFM's popular "Celebrating our Musical Future" series hosted by David Osenberg, on Monday, September 14, at 8 p.m. with a repeat broadcast the following day at 12 noon. YPC Competes in Munich, Germany. In October YPC heads for Munich to compete with the Aarhus Girls' Choir from Denmark and the Romanian Radio Children's Choir in the finals of the 2015 Euroradio Choral Competition, after having been selected by American Public Media (APM) as the only American chorus to represent the United States in this international choral competition. YPC Releases Transient Glory III: On November 20 YPC is releasing its long-awaited Transient Glory III CD on Bang On a Can's Cantaloupe Music label. The album comprises six major highlights of YPC's Transient Glory new music commissioning series for young voices from composers Michael Gordon, Paquito D'Rivera, John Corigliano, Terry Riley, Meredith Monk, and Bora Yoon. "Sparkle" with ABS at the Annual Gala. We sincerely hope you will join us on September 26 to celebrate and support ABS at our annual fundraising gala. This year's event, "Sparkle," will be held at the James Leary Flood Mansion in the Pacific Heights neighborhood of San Francisco. Enjoy stunning views of the Golden Gate Bridge and Alcatraz while sipping delicious wines, bidding on items in our silent auction, and meeting with other arts lovers who admire the music of J.S. Bach and support its preservation through the performances of American Bach Soloists. Dinner will be served and a special live auction will offer opportunities to bid on fabulous trips to Peru, Paris, the U.S. Open, and other wonderful packages. Hosting the auction will be Liam Mayclem, host of the Travel Channel's "World Access" and KCBS's "Foodie Chap." All proceeds from the auction go directly to supporting the performances and educational initiatives of ABS. The Azrieli Music Project (AMP) is proud to announce that Brian Current is the winner of the inaugural Azrieli Commissioning Competition, a $50,000 prize for a new work of orchestral Jewish Music of 15 to 25 minutes duration, by a Canadian composer. Two new prizes of $50,000 each were established this year by the Azrieli Foundation in order to celebrate, foster and create opportunities for the performance of high quality new orchestral music on a Jewish theme or subject. Current's new work – along with the work to be awarded the international Azrieli Music Prize in early 2016 – will be performed by the Orchestre symphonique de Montréal and Maestro Kent Nagano at The Azrieli Music Project Gala Concert at Maison symphonique de Montréal on October 19, 2016. One of Canada's most followed and lauded young composers, Brian Current – a graduate of McGill University as well as UC Berkeley – won a Juno Award earlier this year for his opera Airline Icarus. Azrieli Music Project founder Dr. Sharon Azrieli Perez comments, "I would like to offer my personal congratulations to Brian for both his exceptional talent as a composer, as well as the fascinating proposal he submitted to the competition. In the submissions we received from across the country, the jury noted the extremely high quality of the applicants, as well as the care and thought that went into the excellent proposals. We were impressed with the variety of topics considered and the creative approaches the applicants employed in their attempts to interpret the musical and philosophical questions at the heart of the Azrieli Commissioning Competition." The choice of Mr. Current was unanimous amongst the Azrieli Music Project jury, which includes conductor Boris Brott; composer Aaron Jay Kernis; musicologist Neil Levin; conductor and composer Steven Mercurio; and composer Ana Sokolovic. Luca Buratto (age 22) has been named Laureate of the 2015 Honens Piano Competition. Mr. Buratto wins the world's largest piano prize of $100,000 (CAN) and an artistic and career development program valued at a half million dollars. Finalists Henry Kramer (United States/ age 28) and Artem Yasynskyy (Ukraine / age 27) each received a Raeburn Prize of $10,000 (CAD). "This has been an incredible search for the Complete Pianist," said Stephen McHolm, Honens' Artistic Director. "We look forward to helping Luca take the next important step in his career." The Competition's jury included pianists Alessandra Ammara, Janina Fialkowska and Pedja Muzijevic; Jeremy Geffen (Director, Artistic Planning at Carnegie Hall), Charles Hamlen (Artistic Advisor, Orchestra of St Luke's and former head of IMG Artists), Paul Hughes (BBC Symphony Orchestra General Manager), and Costa Pilavachi (Universal Music Group International's Senior Vice President of Classical A&R). The Jury announced its decision following the Finalists' performances with the Calgary Philharmonic Orchestra and conductor Yan Pascal Tortelier on September 10 and 11, 2015. "All of us on the jury, as well as the audiences at Jack Singer Concert Hall, have experienced two weeks of exhilarating, world-class pianism," said Jury Chairman Charles Hamlen. "Once again, the Honens Piano Competition has shown that it brings to Calgary some of the finest and most creative musicians from around the world. We offer our sincerest congratulations to all of the pianists, with a special nod to 2015 Honens Laureate, Luca Buratto."